Computer Screen Spy Monitor - A computer monitoring software. Computer Screen Spy Monitor software automatically captures screenshots of entire desktop or active windows at set intervals. It is perfect for catching cheaters, monitoring employees, children or spouse. With Computer Screen Spy Monitor, you can enable active window title filtering function and then input some string separated by commas. By this way, while the active window didn't include the string, it will not take screenshot. So, every screenshot which have been saved is important and interested. Here are some key features of "Computer Screen Spy Monitor": 1,Capture Screen. Monitor and record full screens or active windows that may include internet activity such as Windows Live Messenger/Skype/MSN Messenger/ICQ/AOL Messenger /AIM/Yahoo! Messenger's chat conversations. 2,active window title filtering. You can set some string, while the active window didn't include the string, it will not take screenshot. It only save the screen while the active window include the string specified. 3,Stealth Mode. Computer Screen Spy Monitor run absolutely invisibly under Windows systems and does not show in Windows task list. 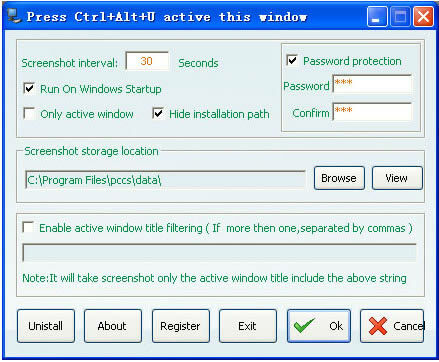 You can also active this monitoring software by hotkey Ctrl+Alt+U. 4,Easy-to-use Interface Despite it's feature, Computer Screen Spy Monitor is a User-friendly graphical program interface makes it easy for beginngers.